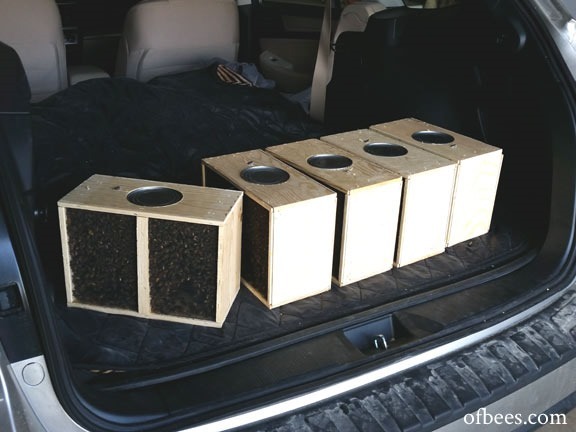 Some local beekeepers have been kind enough to organize transport of package bees for everyone in our area. These package bees come from California from large breeding apiaries. Northern climates like ours (Minnesota) are not able to produce new packages with ready-to-go queens this early in the year so they have to come from warmer places where bees are active year round. Most purchased packages come from California, Georgia, or Texas. 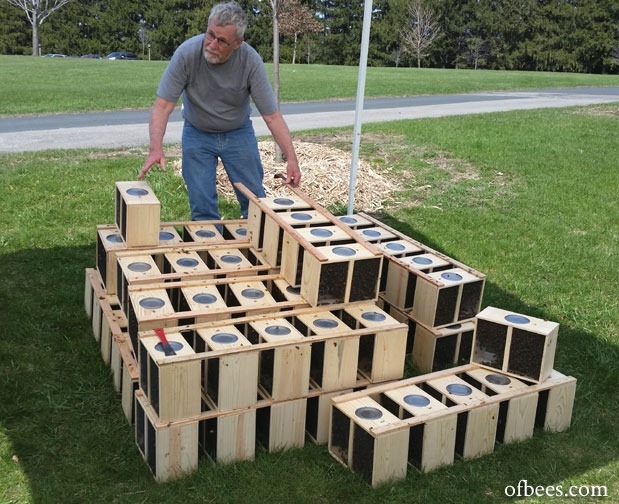 They are moved by semi-truck one time a year, so beekepers band together to place bulk orders for bees. Car-full-of-bees has become a yearly occurrence for me. When bees are in the packages they aren’t very aggressive, since they have no hive or resources to protect. It doesn’t mean you can’t get stung, but they are generally very docile and easy to handle, so it probably sounds a lot more daring and scary than it actually is. Some wild bees that were attracted to the packages end up loose in the car but they’ve never been a bother. 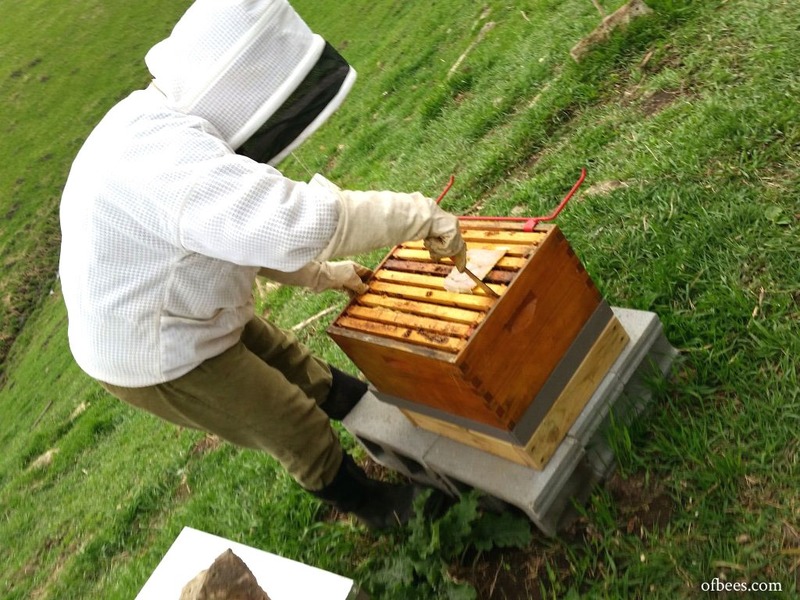 New packages get installed directly into a hive box, supplied with some full frames of honey from our overwintered colonies and a ‘protein patty’ (the white flat thing on top) which is a pollen substitute. Pollen is the bees’ source of protein and is necessary for raising baby bees. A new colony wouldn’t have had the chance to pack it away for the winter in preparation for spring growth. We provide a little bit to get them started until the flowers are blooming and they have enough workers to collect it themselves. Bees prefer real pollen and will ignore the patties if a genuine source is available. 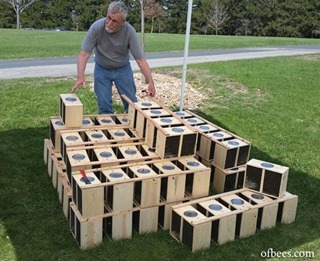 This is what a bee hive box looks like when you remove the cover – the bees are mostly all in between the frames. They often build ‘rogue comb’ (wax cells out of place, seen here haphazardly on the top of the frames). We clean this each time we open the hive so that we’re able to remove individual frames to check the health and progress of the bees. You’ll notice there is a lot of variation in the color of the beeswax comb. When wax is secreted from special glands on the side of the bee, in tiny flakes, it is nearly white. 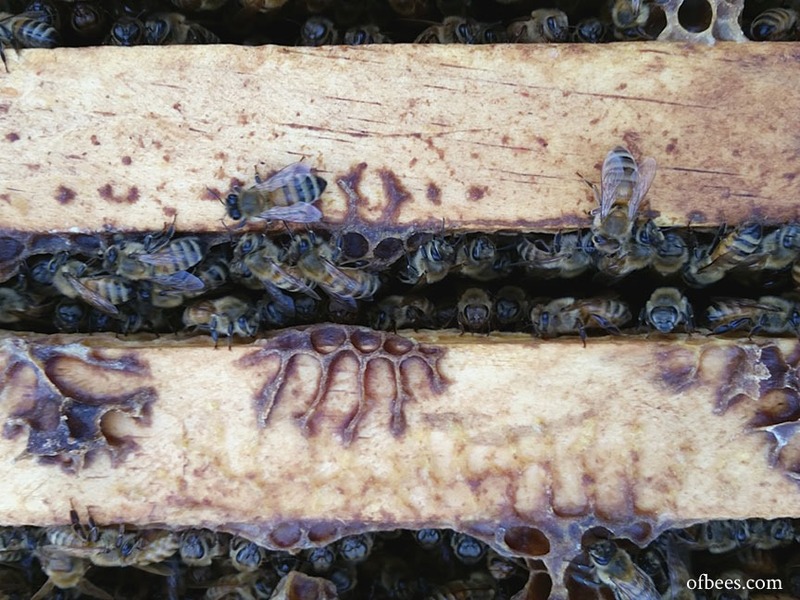 When bees, carrying pollen on their feet, walk across the wax, it gets stained darker. Honey supers (the boxes which go on the very top of the hive to collect excess honey) are usually least visited and pristine white or yellow. The main part of the colony, with a lot of bee activity, ends up being dark brown to almost black. A close up view between the frames in the hive. Bees maintain what is called ‘bee space’ between the frames which mimics the spacing they would build in a wild hive, just large enough for two bees to pass side by side. It is a very exact size and if frames are spaced incorrectly, bees will build all sorts of wonky comb to make it more to their liking. 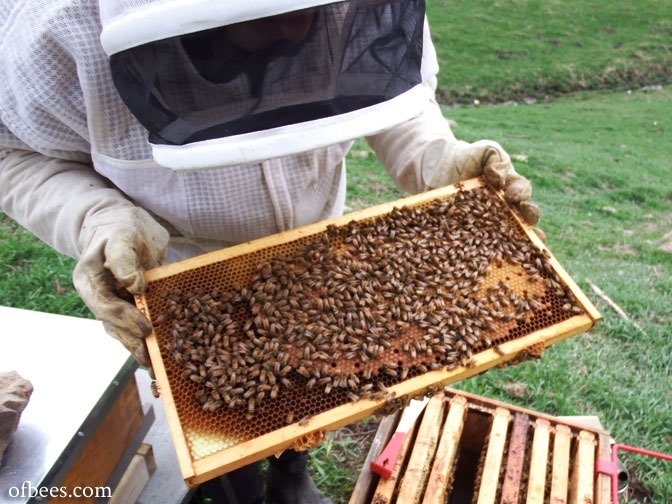 They have the science of maximizing space utilization down to an art, even if it can be of constant frustration to a beekeeper who try to keep things manageable-by-humans. When the bees are first installed we leave them alone for at least a week to get settled and for the queen to start laying eggs. This frame is a from a few weeks after installation – all those puffy cells are brood that has been capped over, the final stage before emerging as an adult bee. 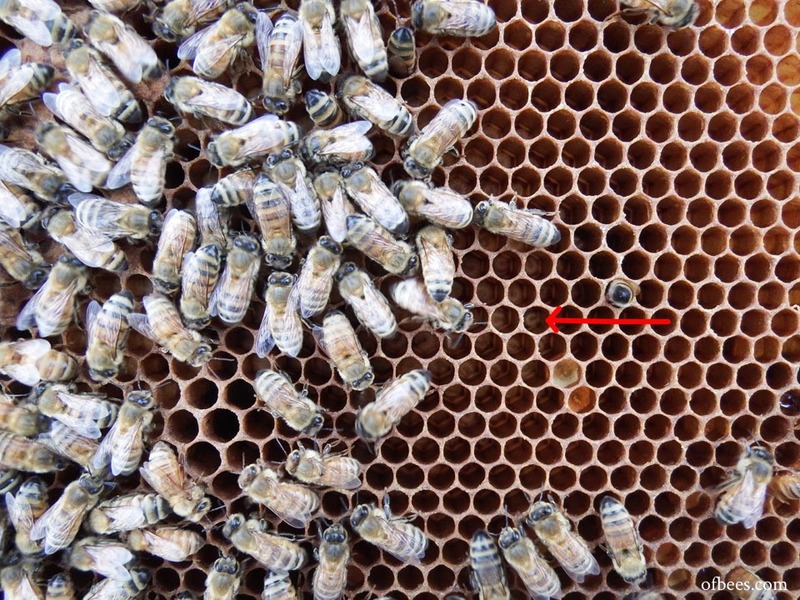 Here is a close up of the cells in a frame showing brood (baby bees). The eggs look like tiny grains of rice about 1 mm long. Those eggs hatch into the C-shaped larvae which grow bigger every day. Once the larva fills the cell it gets capped over with wax so it can pupate and transform into a bee. 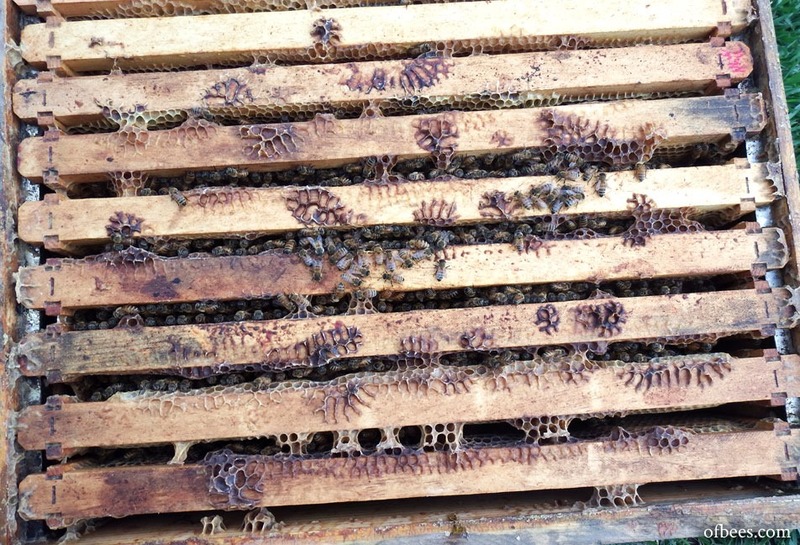 This is what we’re looking for when installing a new hive – the queen herself is often very difficult to find, but if we find eggs and larvae in various stages of growth we know she’s there and doing here job!